EMPLOYEES STATE INSURANCE HOSPITAL, BASAIDARAPUR, NEW DELHI-110015 has posted an advertisement for recruitment of doctors for the posts of senior residents on 3 years tenure basis under residency scheme subject to renewal/extension every year. 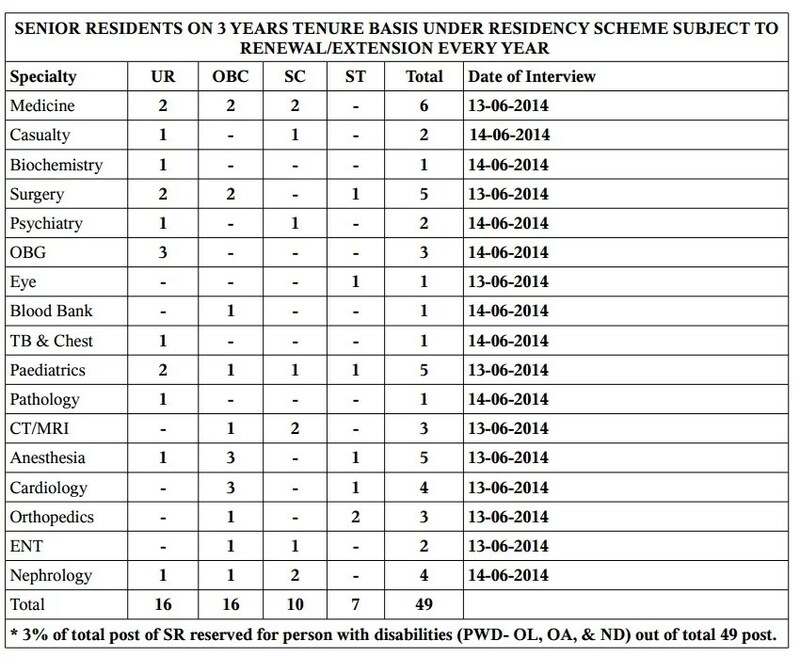 * 3% of total post of SR reserved for person with disabilities (PWD- OL, OA, & ND) out of total 49 post. Interviews will be held on 13-06-2014 and 14-06-2014 depending on speciality as mentioned above. In the pay scale of Rs.15,600-39,100/- +Grade pay of Rs.6,600/- plus other allowances as admissible. PG Degree or Diploma in the concerned Specialty from recognized University and registered with MCI/DMC. If such candidates are not available in the particular specialty, those without PG Qualification having at least two years experience after MBBS in concern specialty out of which one year Junior Residency from a Govt. Hospital in the concerned specialty can be considered. Not exceeding 35 years as on 31-05-2014 (Relaxation for OBC/SC/ST/PWD as per rule) OBC candidates are required to submit latest OBC Certificate as per Central Govt. Proforma (not more than one year old). Demand draft as per D above.